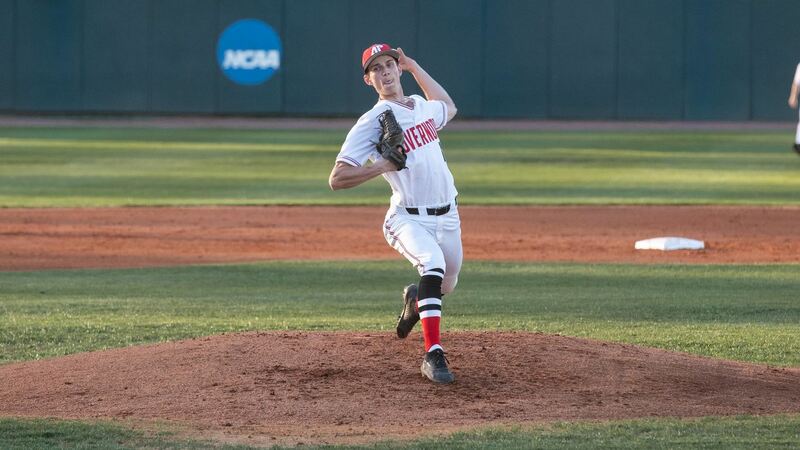 CLARKSVILLE – Starting pitcher Nolan Monaghan took a no-hitter into the fifth inning in his season’s second start, propelling Austin Peay to a 10-2 nonconference victory against Evansville, Tuesday night on Joe Maynard Field at Raymond C. Hand Park. Monaghan (1-1) faced the minimum of 12 batters through the first four innings, doing the bulk of the work himself but also receiving help from his defense. After retiring the first four batters he faced, Monaghan saw a ball misplayed in the outfield, but the defense rallied and retired the runner attempting to take second base. One inning later a one-out walk was wiped when he struck out a batter, and catcher Alex Sala caught a runner stealing for an inning-ending double play. Austin Peay (16-15) supplied Monaghan all the run support he would need in the first inning. Designated hitter David Martinez and center fielder Garrett Spain each earned two-out walks, bringing right fielder Parker Phillips to the plate. The Govs career home run leader hit his 10th of 2019 to right center for a three-run blast. The Govs would break the game open in the third inning, sending nine men to the plate. Phillips would get his fourth RBI of the day with a single to open the scoring. First baseman Andrew Flaherty would tack on another run with a single before catcher Alex Sala drove in two runs with his second double of the game. A wild pitch later in the inning would give the Govs a fifth run and an 8-0 lead. Evansville (17-11) would break up the no-hit bid and shutout in the sixth. Right fielder Troy Beilsmith hit a one-out double and would score on an Austin Peay error that allowed center fielder Nate Reeder to reach base. Reeder would later score on a wild pitch, narrowing the deficit to 8-2, but those would be the only runs Evansville could muster. Monaghan picked up the win after 4.1 no-hit innings, allowing two walks while striking out six of the 15 batters he faced. The Govs bullpen would surrender two unearned runs on three hits and a walk, striking out 10 of the 19 batters they faced. Flaherty led Austin Peay’s offense with a 3-for-4, two RBI performance. Sala, Martinez and Spain each had two hits. Evansville starter Shane Gray (2-1) suffered the loss after allowing three runs in his one inning of work. Beilsmith, first baseman Tanner Craig and second baseman Danny Borgstrom each had one hit. Austin Peay continues its five-game homestand when it hosts Morehead State in a three-game Ohio Valley Conference series, starting at 6 p.m., Friday. FINISH WITH A FLOURISH. Monaghan’s second career start as a Governor saw him go a season-best 4.1 innings without allowing a hit. His six strikeouts – one shy of his season best – also came at opportune times. He ended each of his first four innings with a strikeout and his final out of the day was a strikeout in the fifth. ANOTHER PARKER MARK. Right fielder Parker Phillips’ first-inning home run was his 10th of the season and 41st of his career – extending his career homer mark. However, he also set another home run record – becoming the first Govs hitter to record 10-plus home runs in three seasons.